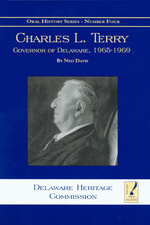 Charles L. Terry was a native Delawarean born in Camden. He spent much of his state career as a judge. He resigned as Chief Justice of the Supreme Court of Delaware to accept the nomination for Governor. The Civil Rights movement, the war in Vietnam, and social unrest were all issues Terry had to confront. The administration reached its dramatic summit following the assassination of Rev. Martin Luther King Jr. and the subsequent riots in Wilmington. Go inside the inner-workings of government as these events were taking place. The book was written by the Governors Press Secretary and is a first-hand account of the Terry administration. Governor Terry died in 1970 at the age of 70. Notify me of updates to Charles L. Terry, by Ned Davis, 2000, 143 pp. Prices reflect the cost of the book PLUS S&H fee of $3.00.